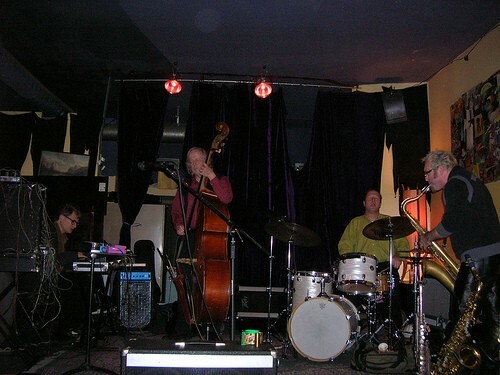 For more than five years the quartet that's come to be known as Extraordinary Popular Delusions has held court at Hotti Biscotti every Tuesday night, playing one or two sets free of charge. In fact, for a while the band actually tried enticing listeners by offering to give them money. 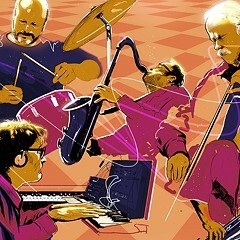 The quartet—keyboardist Jim Baker, bassist Brian Sandstrom, drummer Steve Hunt, and reedist Mars Williams—is a kind of living link to the 80s free jazz in Chicago, before Ken Vandermark revitalized the scene by ushering in a new generation of players in the early 90s. These four guys helped keep the torch lit during that fallow decade, and all but Baker did meaningful service in Hal Russell's NRG Ensemble. The group made a terrific self-titled album for Okka Disk a few years ago, but to understand their real strengths you have to see them onstage; playing a weekly engagement for so long without falling into a rut is no mean feat, and the accomplishment testifies to the band's restless creativity and gift for spontaneity. Last night I ran into Hunt at the Hideout, where we were both watching the Engines play two amazing sets, and he told me that Hotti Biscotti had just been sold and that the change of ownership meant the demise of the Tuesday-night residency, long curated by former Nervous Center proprietor Richard Syska. Extraordinary Popular Delusions have two more gigs at the coffeehouse, on August 3 and 10. Hunt seems confident the band will land another steady gig, and I sure hope he's right. Even if they do, the end of this run deserves a respectful salute—those five years of regular shows represent a deep commitment to making exciting, unpredictable new music for its own sake. Extraordinary Popular Delusions are an example of the local scene at its best.